WASHINGTON — An unspecified number of combat soldiers from the U.S. Army's 82nd Airborne Division have been ordered to northern Iraq, marking the Pentagon's latest escalation in what's been a slow-moving campaign to flush Islamic State fighters from their stronghold in the city of Mosul. "Additional members of 2/82 BCT are deploying to Iraq on a non-enduring temporary mission to provide additional 'advise and assist' support to our Iraq partners as they liberate Mosul," U.S. officials in Baghdad told Military Times on Sunday. The unit designation refers to the division's 2nd Brigade Combat Team, a force of more than 4,000 based at Fort Bragg in North Carolina. A brigade combat team comprises infantry, artillery and cavalry troops, plus their supply pipeline. About 1,700 soldiers from the same unit are overseas now, spread between Iraq and Kuwait. It's unclear whether the full remainder — approximately 2,500 paratroopers — will receive deployment orders. Earlier this month, a top Army general told Congress there were plans to do precisely that, and distribute those personnel within Iraq and Syria. It's a sensitive topic for several reasons, not the least of which centers around a deepening desire in Washington to limit the perception abroad that America's military footprint is growing in Iraq and Syria. The Trump administration also has expressed a desire to limit what information it telegraphs about military strategy. There are 5,262 U.S. troops authorized to be in Iraq, and another 503 in Syria, officials told Military Times on Sunday. 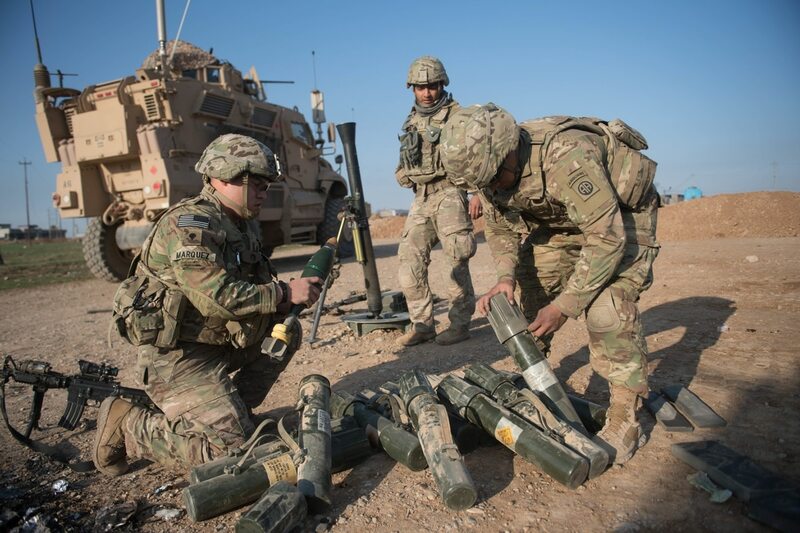 But the numbers have been considerably larger for quite some time as commanders leverage what they call temporary — or "non-enduring" — assignments like this one involving the 82nd Airborne in Mosul. It's believed there are closer to 6,000 Americans in Iraq, not including this new deployment. Nearly 1,000 more are on the ground inside Syria, where several hundred additional personnel arrived in recent weeks to bolster allied forces targeting the city of Raqqa, which ISIS considers its capital. The Pentagon is reportedly weighing plansto send upwards of another 1,000 troops there. If those plans bear out, the U.S. would have closer to 10,000 military personnel on the ground for a mission officials continue to call advisory. The deployment announcement comes as U.S. commanders face growing pressure from the White House to intensify the fight against ISIS in both theaters, and step up efforts to dismantle terror groups elsewhere that threaten the U.S. and its interests. U.S. officials told Military Times that none of the 82nd Airborne soldiers bound for Mosul is expected to be rerouted to Syria, where a major U.S.-backed operation, launched last week, seeks to sever the Islamic State's last escape route from Raqqa. That effort involves an unspecified number of American military advisers, supported by Marine Corps artillery and U.S. warplanes. It also coincides with reports, published Saturday, that Iraq's security forces have temporarily suspended operations in west Mosulamid fallout from a March 17 airstrike suspected of killing more than 100 civilians trapped in the fighting there. The U.S. military is investigating those claims, but has acknowledged conducting an attack on ISIS fighters in the immediate area. The battle in Mosul has worn on for five months, and an estimated 2,000 militants remain entrenched there. It's been complicated by a variety of factors, including the Islamic State's propensity to use civilians as human shields. Army Maj. Gen. Joseph Martin, who oversees all coalition land forces in Iraq and Syria, told Military Times last month that the block-by-block fight is the most complex he's witnessed due in large part to the city's size, which he equated to Philadelphia, and the amount of time ISIS had to establish its defenses. And even as the Iraqis make progress, he noted, ISIS continues to adapt. "It's urban combat of the like, of a scope and scale I have not see in thirty-one years," the general said, "and I've served in combat a couple of times."